Written on June 20, 2014 at 12:02 pm by Air Coole VW Love! Volkswagen imported the first VW Camper van to the UK in 1955 and a year later, transporter production moved to a new factory in Hanover. The campers were fitted out by Westfalia, a coachwork company who worked in partnership with VW for many years. There were a huge number of configurations of the furniture and other companies produced conversions too. The split-screen campers had the same air-cooled engines as the panel vans and the same 6 volt electrics. 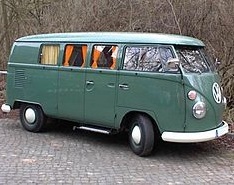 The taller and larger bay window VW camper had 12 volt electrics, a sliding side door and larger engine. It still had a friendly, rounded shape but with better visibility and more space. Over three million were made during 12 years of production. Westfalia continued to do conversions, and a large number of other companies in the UK such as Devon, Danbury, Canterbury and Dormobile, joined the market too. There are also VW camper vans that have been converted by small companies and DIY conversions. Up top there were a wide range of pop-ups to give more space – ones that go straight up, examples with bellows, side-fixed (they are often Dormobiles) plus the type hinged at the front (wedges) from Devon. Versions of the bay window are still in production in Mexico and were produced in Brazil long after VW had stopped production. 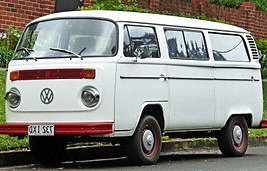 The third generation Transporter was introduced in 1979. 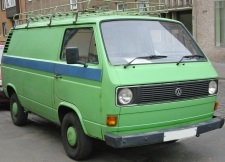 The VW t25 was larger again and provides substantial space. It was known as the Vanagon in the USA and is often referred to now as the VW t3. This model is much more angular with a very 1980’s shape. In 1982, after 32 years and with production totaling over five million vehicles, the Transporter switched from air-cooled to water-cooled engines – but still rear-mounted. The fourth generation Transporter was introduced in 1990 and marked a major change. It was the first to have the engine at the front to leave a completely flat load area. It is a pronounced wedge, but still a relatively sleek shape with a huge amount of space. Autosleeper, Bilbo, Reimo, Danbury and Westfalia all produced camper conversions. The Caravelle is the people carrier and the California is the Westfalia camper. The other conversion companies all have their own names for their range of models. The current, fifth generation Transporter made its debut in 2003, and in 2007 rock legends, The Who, performed live at an official event to celebrate 60 years of Volkswagen vans which was held in Hanover, Germany. It attracted 71,000 visitors with an amazing selection of over 5,000 Transporter vans and campers. Over the period of sixty years over 10 million transporters have been made. VW camper van conversions have been produced for each transporter model – and by a large number of companies. And then there are the small company and amateur conversions, too. But now you do have a good overview, so should at least ask know what questions to ask, when you’re buying, or just admiring a VW Camper. Air Coole VW Love! tagged this post with: VW Camper Read 13 articles by Air Coole VW Love!